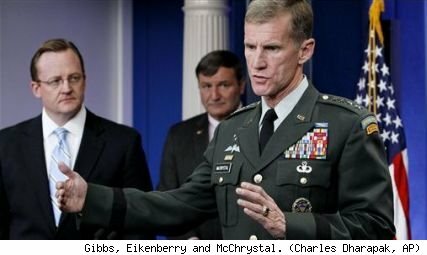 McChrystal is giving himself and his boss ……. President Obama plenty of wiggle room….. In a White House briefing, neither McChrystal nor retired Gen. Karl Eikenberry, now the U.S. ambassador to Afghanistan, would say whether they believe enough military progress and political reform will take place by next summer to enable U.S. troops to “begin to transfer” back home from Afghanistan, as President Obama has promised. “Much work lies ahead” before that can happen, said McChrystal, who commands all U.S. and allied troops fighting the Taliban and other extremists in Afghanistan. The months ahead “will demand courage and resilience,” he said, adding that violence against Americans will continue to increase. 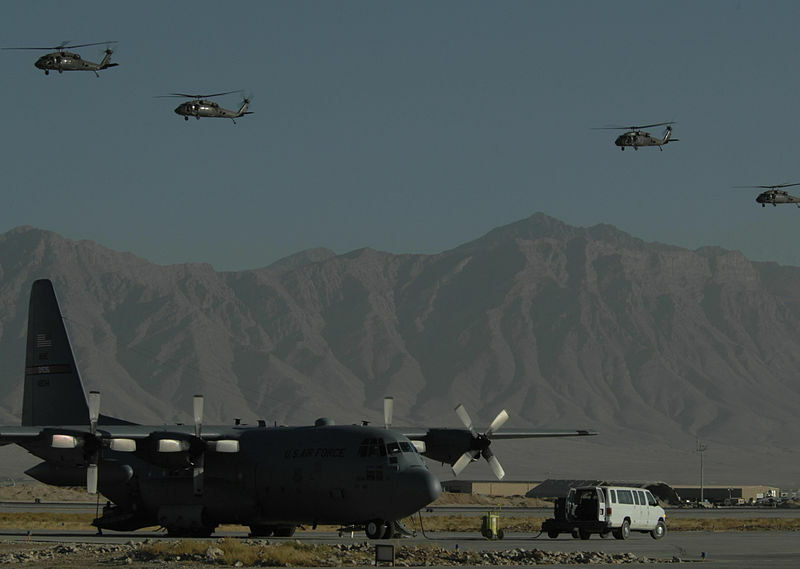 The United States….. feeling that they are taking the war in Afghanistan to the Taliban …and emboldening Pakistan to do the same….. finds itself in position to start thinking about an end game…even as the ‘surge’ troop levels continues to climb….. The Dog implores everyone to stop and think about this….. I don’t care what people say…’surges’ work….and their use by Obama has only served to reinforce the fact the then Defense Secretary Rumsfield was a miserably bad director of this country’s first campaign in Iraq…..
By disregarding the ‘Powell Doctrine’of using overwhelming force…. he wasted lives and caused billions of dollars of waste to occur….. The guy was a failure ….it took Bush to long to relieve him from office…..and Obama to clean the mess up…..
Bush simply never got to this point…conceptually and ideologically…. The President and Commander-in-Chief will discuss possibility reaching out to the Taliban leadership that is still alive for peace negotiations…. Here’s something on the move which was used wholesale in Iraq with good success…. President Obama met with his war cabinet on Friday, and the issue of reconciling with the Taliban is gaining traction, even as administration officials debate whether the time is right. A senior administration official pointed to recent successes by American and Pakistani forces in capturing and interrogating senior Taliban leaders in Pakistan. In addition, administration officials have sought to maintain a full-court press to persuade their Pakistani counterparts to keep attacking Taliban operatives, the official said. Defense Secretary Robert M. Gates, Gen. James L. Jones, the national security adviser, and Adm.Michael Mullen, the chairman of the Joint Chiefs of Staff, have all traveled to the region recently to try to keep the pressure on both Afghan and Pakistani officials. “It is now more a question of ‘when’ than a question of ‘if,’ ” the administration official said, when asked about the idea of reconciliation talks with senior Taliban officials. But both officials added that, for now, there are no plans for reaching out soon to high-ranking Taliban leaders. That effort, they said, is likely to wait until after the United States takes on Taliban insurgents in Kandahar in what is expected to be the next major military offensive in Afghanistan. The effort was also brought up by the British who have troops in country…. The momentum behind reconciliation got a major boost this week from Britain, the key American ally in Afghanistan. In a speech in Boston, the British foreign minister, David Miliband, called on President Hamid Karzai of Afghanistan to make as concerted an effort to reach out to disaffected Taliban leaders as British and American troops are making to integrate lower-level Taliban soldiers. The issue — brought up by Mr. Obama himself — was discussed during the 90-minute session in the White House on Friday, administration officials said. But no decisions were made. Participants included General Jones, Secretary of State Hillary Rodham Clinton, Admiral Mullen, and Richard C. Holbrooke, the special representative to Afghanistan and Pakistan. The Civilian 'surge' in Afghanistan isn't much of a surge……. The State Department’s own Inspector general has issued a report recommending at least a 100 changes to improve the departments failure to follow up the military’s ground gaining in Afghanistan….. While the group under the US Ambassador from State did an impressive job when they started….. This report is critical…because it highlight a weakness found in the Iraq war camapign……The Satae Depart was left out there because they could not keep up with the pace of the military in country and they simply did not have the person power to do their job…..While the Dog like s Secretary Hillary Clinton…..part of the blame for this short coming must lay at here feet…..she is a very good details person…but like her primary campaign she seems to be unable to actually manage anything….. The so-called “civilian surge” in Afghanistan is mired in bureaucracy and may not succeed in time to help the war effort, a State Department report found. The report released Friday said U.S. diplomats spend too much time giving war zone tours to visiting officials . They have struggled to house, feed and transport an influx of new civilians. And they can’t get regular sleep because bosses at the National Security Council and others in Washington call for briefings from midnight to 4 a.m., apparently unworried about the different time zone. The department’s inspector general said the U.S. ambassador to Afghanistan, Karl Eikenberry, and his team made impressive progress during their first six months in Kabul toward carrying out the “civilian surge” ordered by the Obama administration to accompany its military push. The force of agriculturalists, lawyers, engineers and others — which nearly tripled from 320 people to about 900 early this year — is meant to encourage the Afghan people to like their own government more than they like the Taliban. But Eikenberry’s team has been challenged by the unprecedented pace and scope of the civilian buildup, the report said. “Even with the able leadership of senior officers, the best of intentions and the most dedicated efforts, Embassy Kabul faces serious challenges in meeting the administration’s deadline for ‘success’ in Afghanistan,” the 146-page report said. The report said about 100 groups including more than 700 people had visited by October and that a dozen more congressional delegations were expected by the end of 2009. “Although congressional and other VIP travel builds crucial support for U.S. efforts in Afghanistan, it also taxes the same military and civilian assets that would otherwise be deployed in the vital counterinsurgency and reconstruction efforts that the visitors seek to evaluate,” the report said. The report makes more than 100 recommendations on a wide range of issues, from managing resources to morale and quality of life. The Civilian ‘surge’ in Afghanistan isn’t much of a surge……. The British Prime Minister is heading for an election soon…..
And needs to help fully equip his troops with enough equipment to do their jobs safely…. British Prime Minister Gordon Brown promised British troops 200 new patrol vehicles that can resist roadside bombs more effectively during an unannounced visit Saturday to southern Afghanistan. Brown made the trip to Camp Bastion in Helmand province to thank some of the 4,000 British soldiers who are involved in a 3-week-old NATOoffensive to wrest control of the Taliban haven of Marjah from the insurgents. ”We will do everything we can to support you with the equipment necessary and the resources you need,” he told the troops, according to the British Press Association. Brown, who faces a difficult election campaign in the coming months, has been criticized by the British press and by some opposition politicians for failing to provide enough protection for soldiers in Afghanistan. Critics have cited a shortage of helicopters — forcing soldiers to use dangerous roads — and the lack of strongly armored vehicles as factors that have left troops vulnerable to improvised explosive devices. His visit came as Britain’s military said one of its soldiers died after being wounded by an explosion in Helmand on Friday. More than 265 British soldiers have died since the war began in 2001, with many perishing during roadside explosions as bombs used by insurgents have become more effective. Thousands of U.S. Marines and Afghan soldiers traveling in helicopters and mine-resistant vehicles began punching into a key Taliban stronghold in southernAfghanistan early Saturday, as the largest military operation since 2001 to assert government control over this country got underway. The first wave of Marines and Afghan soldiers swooped into the farming community of Marja about 2 a.m. Saturday local time (4:30 p.m. Eastern), their CH-53 Super Stallion transport helicopters landing amid clouds of dust on fallow fields. As the troops, weighed down with ammunition and supplies, lumbered out and set up defensive positions, AV-8B Harrier fighter jets and AH-1 Cobra attack helicopters circled overhead in the moonless sky. Two more waves of troops touched down over the following 90 minutes near other strategic locations in Marja. Like the earlier contingent, they did not meet with immediate resistance. At sunrise, hundreds more Marines and Afghan soldiers plan to enter the area by land, using mobile bridges to ford irrigation canals —built by U.S. engineers more than 50 years ago — that have served as defensive moats for the Taliban. Heavily armored mine-sweeping trucks and specially outfitted tanks will work to carve a path through a belt of makeshift bombs buried around the town. The Marines entering Marja are with some of the first new military units to arrive in Afghanistan as a result of President Obama’s decision in December to authorize the deployment of 30,000 additional troops to combat a growing insurgency. 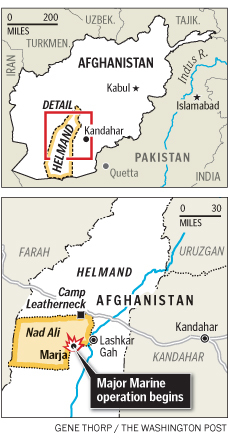 The operation is intended to deprive the Taliban of a haven in Helmand province, which military intelligence officials say is home to numerous bombmaking facilities and drug-processing labs. The question will be ….like in Iraq…can they hold the ground after taking it….and can they get the locals to feel secure enough to resist the Taliban…..
A small minority sect in Aftghanistan is doing good with education….not money…. In an interesting insight into the Afghanistan that the Western media does not concentrate on…we see in this piece from the New York Times that the Hazara sect is busy consolidating its hold on educating it’s youth…..these gains will certainly mean that after the Pashtun and Sunni’s keep fighting each other and decimate their population’s….the Hazara sect will come into control of the country…..while they are not fighters…..the shere numbers of their educated are their wave to the future….. If the United States could isolate the bad guys….open the countries natural resources……get the countries military up to speed ……and have the country begin to get revenue from the resources …and help the educated …..the centuries old country could emerge as economic and stabilizing force in the region…..